Previous U.S. Navy surface operations of this kind have challenged China’s requirements for prior notification before the conduct of innocent passage transits in the 12 nautical mile zone of the features it occupies in the Paracel group. Notably, Woody Island in the Paracels hosts China’s largest island facility in the South China Sea, which has more than 1,000 permanently stationed military personnel and an airstrip capable of accommodating fighters. As with previous operations, the Chinese Ministry of Foreign Affairs condemned the U.S. operation. “We urge the United States to immediately cease this kind of provocation,” said Lu Kang, a spokesperson for the ministry. He added that USS McCampbell’s maneuver had “gravely infringed upon China’s sovereignty.”“We will be on high alert and will closely monitor the air and sea situation to strongly defend our sovereignty and security,” he added. Last year, a Chinese Peoples’ Liberation Army Navy destroyer was attempted to intercept a U.S. Navy destroyer conducting a freedom of navigation operation in the Spratly group when it came within what the United States said was just 40 feet of the bow of the U.S. warship, forcing it to maneuver. The incident could have caused a collision, U.S. officials said at a time. The latest operation comes as U.S. and Chinese officials convened in Beijing to carry out the first trade talks since the meeting between Chinese President Xi Jinping and U.S. President Donald J. Trump at the 2018 Group of 20 leaders’ summit in Buenos Aires, Argentina. The decision to conduct the operation underlines that political considerations may not have altered the United States’ decision to keep these kinds of operations on a regular timetable. 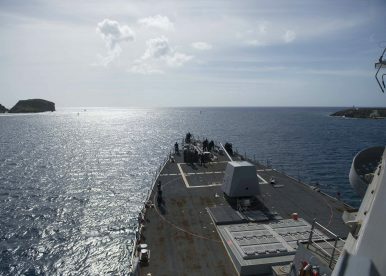 Though not all freedom of navigation operations become publicized, the last known operation conducted by the U.S. Navy took place in November 2018, when USS Chancellorsville sailed near the Paracel Islands. That operation was preceded by the USS Decatur’s in the Spratlys—the same one that resulted in the near collision incident. Monday’s operation is also the first since the Asia Reassurance Initiative Act, which directs the U.S. president to continue freedom of navigation operations, became law. The U.S. Navy’s freedom of navigation program is global in scope and targets excessive maritime claims by a range of states, including U.S. allies and partners. In 2017, the U.S. Navy’s operations focused on 10 Asian countries, including China.